In the early 1960s, South Korea’s economy was in shambles. Unemployment was high, and per capita annual income was low (only US$87 in 1961). In order to help the desperate situation, in 1962, the government began sending its citizens to work in West Germany. This continued until 1973, when West Germany stopped accepting gastarbeiters, or guest workers. Over that time, more than 8,000 miners and 13,000 nurses made the move, sending most of the money they earned back to family in South Korea. In all, they contributed US$50 million to the Korean economy, and in exchange for the influx of needed workers, West Germany gave South Korea credit at reduced rates. Let’s work for the honor of our country. Even if we can’t achieve it during our lifetime, let’s work hard for the sake of our children so that they can live in prosperity like everyone else. The president’s speech ended when he choked up with emotion, and the final strains of the Korean national anthem were nearly drowned out by all of the crying. Years later, South Korea showed its appreciation for the sacrifice of those who went to Germany by inviting them and their families back to take advantage of discounted plots of land. 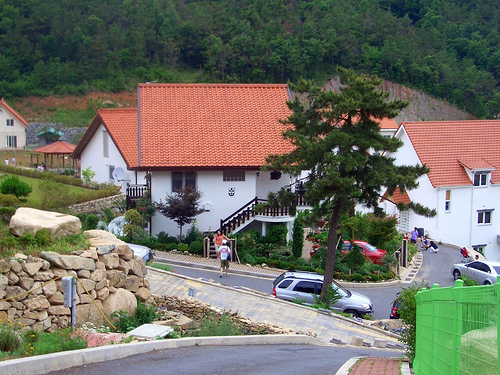 Namhae County, in 2002, even founded Dogil Maeul, or German Village, on a mountainside overlooking the ocean. The community is open to those returnees who spent at least 20 years in Germany and who want to build a subsidized house following a prescribed German style. The head of Namhae County, Ha Young-Je, told The New York Times that one problem with the village is that some residents still live in Germany and make their house in Korea a holiday home, traveling back to Europe every nine months to retain their citizenship there. At the time the article was written, Namhae County was making plans for an American town for returning Korean-American retirees. One difference from its German counterpart is that people who move there would need to give up their foreign citizenship, said Ha, requiring them to live in South Korea full-time. And for Korean Americans looking for a more urban experience to return to, there’s Korean American Village, scheduled to be built in the Songdo International Business District. The Korea Economic Daily reports that the finished multi-structure high-rise project will contain over 3,000 residential units, including apartments, office-residence complexes, and residence hotels. You are currently reading A Little Slice of Germany on a Mountainside in South Korea at Clearing Customs.